"Synthia Saint James Paints Fire Rainbow Obama"
The people looking up at the rainbow (Obama's spirit)�are from all walks of life and from all around the world. Never before have I seen the world embrace a United States President with such joyful hope and pride. 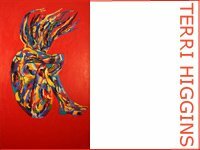 Saint James will sign the completed painting�"Fire Rainbow Obama" this week,�and will be releasing it as a Limited Edition Giclee on Canvas in 2 sizes.